Simply drops into place over beams to function as a shelf within racking systems, allowing storage of smaller items and providing support for damaged, weakened or non-standard pallets. Dexion Mesh Decking functions as a shelf by resting on pallet racking beams providing an alternative to timber decking and solid steel panels. Usable for the storage of small cartons at picking levels and non standard pallets sizes, mesh shelving can also provide protection for workers operating under tunnel bays. Perfect for ambient warehouses and cold storage, mesh decking permits the free flowing of air throughout a facility. This also makes it a safer option than wooden shelving as it works better with sprinkler systems. Mesh decking can be supplied in differing designs to best suit the application it is being used for. 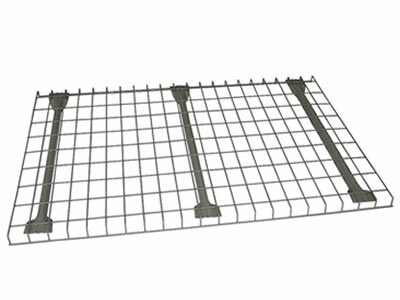 The standard design has the mesh joined to support bars which rest on the pallet racking beams to help transfer and disperse the load. 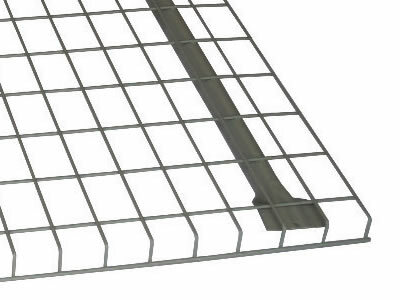 For heavier duty applications pressed locked steel grating with 90 degree steel angles sits on the pallet racking beams. Available to be designed to specification, Wiremesh Decking can allow additional support, safety and functionality within your racking, making your facility safer and more efficient. Order now, or if you would like information on alternative configurations, speak to one of our sales advisors on 08082399422.